← Absolutely Nothing To Grow – I say tomato…. Anyone who follows this blog will know that I’ve a bit of thing for online shopping. It’s nothing to be concerned about, I don’t have bedrooms and cupboards full of online acquisitions, but for the most part it’s my preferred form of shopping. I think I like the packages arriving at my door more than anything else really and today is one of those days. As well as having a bit of a thing for online I also have a bit of a thing for bed linen and all things which make me feel like a real life home maker and grown up. The last time I really indulged in any kind of bedroom linen stuffs was when we were married and other than the odd pillow case here and there, I haven’t treated myself for ages – really truly. Have you seen the prices of duvet covers these days?! Blimey. So I’ve been saving and waiting for the Cologne and Cotton sale and am now the proud owner of a MATCHING set. It’s the little things which make me smile on a Friday. 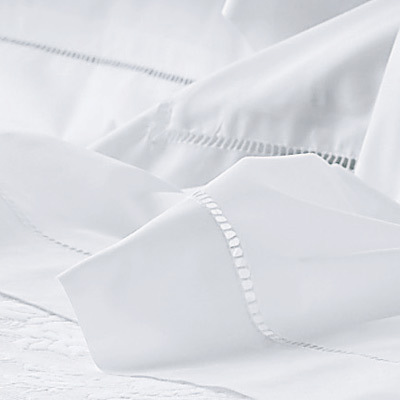 It’s white and cotton and lovely and will guarantee me the perfect full 8 hours of restful sleep. And when I’ve made my tissue peony pom poms to hang from the beams, my boudoir will be complete and my husband may never forgive me.